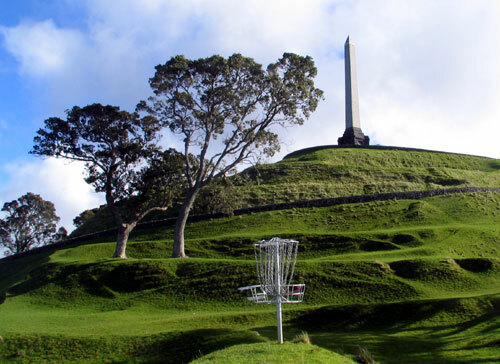 The Crater Cup of Auckland is a traditional disc golf tournament that has been running for over 15 years, orginating from the group of characters affectionately referred to as Freaky Styley. 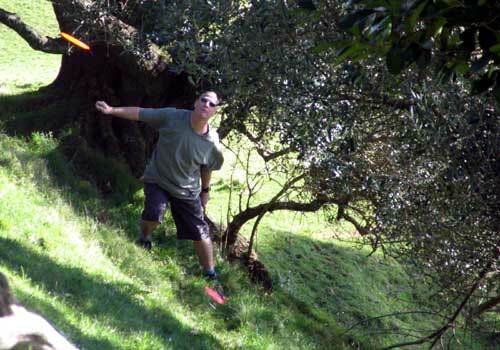 The annual tournament quickly became a New Zealand Disc Golf Tour Event upon its inception and yet still retains its one quirky rule: the current champion organises the tournament and course. This has led to a slightly (or extremely) different course each year, opening the door for a course record every year! There has been the Greater Crater, the Predator Crater and more. Pass Us The Vista Baby - Looking south over the industrial area of Otahuhu and the inner reaches of the Manukau Harbour, Dylan Cooper (Wellington) hopes desperately that the winds do not take his disc too far from the target on the devilish 4th - called 'Blame Marty'. 2006 was a little bit different, as the 2005 Champion was an Australian Tim Marchbank who beat 4 times Champion Simon Feasey in a wonderful battle (see story here). With Tim residing on the other side of the ditch, and possibly not even being able to get across to defend his title, someone had to put their hand up to run the '06 Crater. Gabb quickly knew of several holes he wanted to incorporate in what was to become known as the Traitor Crater (more about Marty later...). 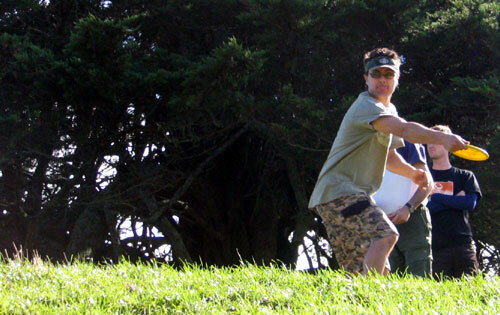 "Having played most of the Crater Cups with their different courses, there have been several holes that I remember being great disc golf holes in my mind, so I wanted to try and include as many of them as possible." "There is the second - identical to a few Craters past. The 3rd is from the course Steve Scarbrough designed for 2004. Hole 8 is one we like to play on the regularly played EleCrater. The 9th and 11th take us back to the original Crater course. The long par 4 12th is just wicked - so many (not so good actually) memories of that one." Rather than circumnavigating the hill, this time the Traitor Crater was to figure 8 on itself - enabling players to revisit the clubhouse several times in a round. Gabb also made sure that there were plenty of opportunities for groups to watch others playing, "That's one of the cool things of a disc golf tournament." said Gabb, "Being able to witness good (and bad) golf from most of the field during your round. And there was even to be a shared pin (10 and 18) and a shared tee (2 and 18), leading for a lot of 'How's your round going?" inquiries. Good stuff. Whilst the course did not travel great distances, it certainly achieved quite a few attitude changes. And, based on the tired players after a couple of pre-lim rounds, it was going to be as much a test of stamina as skill. The Ace - Ever since the Ace Pool started to build, every player had been thinking at the tee 'Will it be me'. Well, we were there when Marty de Haas (Auckland) stood up for the third time to the tee on the nasty 6th. After registering two triple bogies on this hole, you would imagine he would be conservative. But as the sun breaks through the trees, we can see the conviction of an Ace Run as Dylan shouts encouragement. Great footage by Len as the group celebrate Marty's $284 throw - well done Scratch! Note: video file size is 2.4 meg. The chosen format was to be an initial round of doubles to enable players to familiarise themselves with the course - followed by three rounds of singles to find out who could master the Traitor Crater. The event began with the arrival of the first out of towner on Thursday evening. Pete Boyle had driven up from sunny Taumarunui to stay with the Gabb's at the Lindis Estate. Pete's car was packed with lots of books that he had collected on his way up - adding to his extensive collection of New Zealand literature. The books were crammed everywhere, as also in the BoyleMobile was Pete's entire drum kit! He had heard there was a chance of making some sounds with the Freaky Styley crew and indeed, that night, Pete got to bash some tunes out with Baz, Kim, Deb and Gabb. Great late night preparation for the Crater. Friday afternoon saw course set-up get under way. Gabb was already feeling the pressure of being TD, with his main helper Marty de Haas laid out with the flu. And with players arriving keen to play the course, Gabb was running everywhere with helper David Keene and the Tauranga Twosome of Mark and Dean to get things ready. Marty's flu was going to be a big hurdle to overcome if he was to perform. One could see he was keen when he turned up on the course mid afternoon. And we could see he was certainly in the wars when he was laid out flat on the ground after walking into a sharp pointed branch. Blood soaked his scary red/blonde hair as he pokes at the new hole in his skull. Would we even see him Saturday? With David Keene being called away to save his soccer team and Marty getting as much rest as he could, poor ol' Gabb was out at One Tree Hill early Saturday on his lonesome setting up the last 6 baskets ready for play. Many of the disc golfers consider themselves weathermen and all the talk was of wind and rain. Shared Tee - Baz Keene (Auckland) on the second. Or is it the 18th? With the wind blowing across the fairway, one could be excused for being confused. Baz was! The Beast - The left handed legend that is John 'The Beast' Helmink (Auckland) pleased the gallery by attending the Crater Cup. With that classic pivot technique, The Beast was noted to fire one of the biggest shots ever on the 4th. Shame it wasn't towards the target! Nice save for a 6 though. This is a more refined shot on the second. Good Partner Work Part 1 - After a great forehand drive on the first, see as Brett Hailstone (Waiheke) fires a little low. It's now up to his doubles partner Baz...watch both shots in one. Good Partner Work Part 2 - The same team at work - this time Baz Keene (Auckland) plays the layup role (scary layup though - did Brett put him off?) but watch as Brett fires a wicked putt in the wind. Good Partner Work Part 3 - And completing the lesson in doubles play, Brett once again misses only to be saved by Baz and his famous 'Dump' putting technique. Mean Dean - Coming in from a great win at the 2006 Tauranga Extreme, Dean Marshall (Tauranga) was once again throwing those massive drives. A course record 51 in the final round was impressive, but not enough to pull in the ever consistent Simon Feasey. Nothing Fishy About This Character - What a strapping lad our Joe 'Fish' Seebuck (Auckland) is here on the 5th tee. Unfortunately a bout of the flu saw Fish withdraw from Sunday's rounds, but not before this Ultimate Man impressed us Saturday on the slopes of Maungakeikei. "We Did It Jim!" - For the third time in a doubles random draw, Dylan Cooper (Wellington) found himself partnering the elusive Jim Gabb (Auckland). Here Dylan celebrates saving par for the third dicey time on the 5th. Stepping Into It - After surviving the tough 12th, Paul Cohen (Waiheke) follows through in true style in the attempt to secure a birdie on the knoll-to-knoll 13th hole named 'Serf's Up' after the jovial Dave Hartley..
Intelligentia - The views from this course were second to none. But right now, Wellingtonian Tim McVitty is more focused on surviving the nasty 4th, designed by mean man Marty de Haas (try typing 'Marty' into your cellphone and see what autotext spells...!) 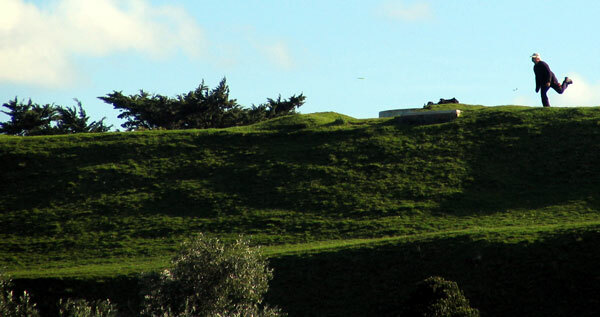 rather than the views back to Rangitoto Island and the stunning Waitemata Harbour. Tim was one of the celebrated smart guys who created the great 'Spa Of Wisodm' at Lindis on the Saturday night..
Virgil Reality - It can hardly be a Crater Cup without Virgil Reality (Auckland). However, our trendy Freaky Stylist was conspicuous in his absence on the Sunday. Perhaps after a tough and controversial episode on the 12th in the wind where an asterisk on his card denoted an up-and-down, up-and-down series that would crush weaker men. Go Barcelona! - Another Freaky Styley originator and Crater Cup stalwart is Dave 'Serf' Hartley (Auckland), seen here finishing off the long 10th with doubles partner Gene Tutaki (Auckland) with a nice steady putt. Good effort considering his recently broken arm thanks to venturing out to Hunua on his new mountainbike with the crazy Freaky Styley Fat Tyre Boyz. Marty's Madness - Course designer Gabb was quick to claim he had little to do with the 4th hole, named 'Blame Marty'. Yes, de Dev had hoped to play a part in designing 1/3 of the course and was disappointed to be handed just one! He made up for it by placing the pin right in the face of whatever wind may be blowing. And who let him replace the target on Sunday?!?!. This hole did see one of the plays of the week when Dean recovered from down the bottom to record an amazing par. Great Golf - When you see these next few shots by Brett Hailstone (Waiheke), you would not be surprised to find out he was the tournament leader after the first round. After a disappointing putting performance in the Tauranga, Brett was on fire, kachinging from everywhere in the wind to show that a permanent course at home can do wonders for your game. Here he saves par on the tricky fifth. On The Beat Pete - This athlete just doesn't stop! Pete Boyle (Taumarunui) arrived in Auckland with his complete drum set so as to jam it up with the Freaky Styley Muzos. And he even found time to buy a new mountainbike for his escapades around the Volcanic Plateau! Here his famous forehand is unlucky when he hits a few leaves as he is heading for the 18th green. Leaning Lefty - One of the men responsible for making the 2006 Crater Cup a success, Marty de Haas (Auckland) enjoys the actual crater section of the course with this strong into-the-wind drive on the 13th. Most players enjoyed Marty's cheffing skills on Saturday night as he whipped out an awesome salmon dish for over 20 people. Wicked. Happens To Us All - National Champion and Crater Cup 2006 Champion Simon Feasey (Auckland) shows poise and control on the 1st green, only to see his disc bounce off the chains. But it is the mental attitude to such disappointments that makes a champion. Simon went on to shoot 55, 55 and 56 to take out the tournament by a convincing 3 shots. Disc Golf Fortitude - And that mental fortitude was needed again here with 5 holes to go in the tournament when Simon's drive stayed up in the tree. As you can hear, the gallery were very aware of Simon's falter in the 2005 Crater Cup when Australian golfer Tim Marchbank was able to shadow the tall Aucklander in the last round and take it out in the final holes..
Lucky Break - Here's de Dev himself Marty de Haas (Matamata) on the hole named after him. And lo and behold, there is very little wind! Lucky bugger. The Fart Throw - Jim Gabb (Auckland) was never one for a conventional approach. And here on the third tee, he shows power with a touch of sillyness as he tries to make the altitude. On The Mark - Our cameras did not catch much of Mark Conway (Tauranga). Shame - as there was much talk of the variety of his throws. From hammer to forearm to the Conway Curve. Here he throws a more conventional lay up for par on the first hole. Dylan Does It! - The 2006 Crater Cup marked the comeback of Dylan Cooper (Wellington) from massive knee surgery. And what a course to do so...but it wasn't like he was going to relax. And here we see a great 25 footer straight into the chains for a birdie on the 15th. 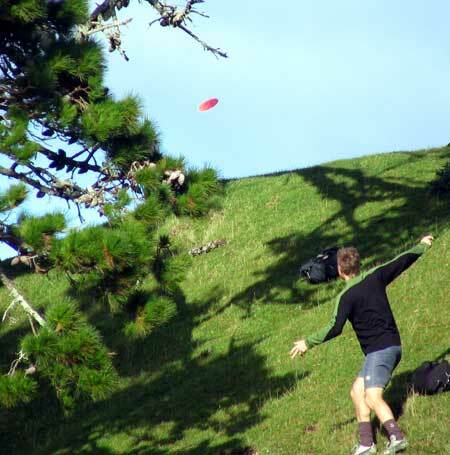 Controlled Flight - Hole 13 and Dylan Cooper (Wellington) shows the control of a seasoned disc golfer. And the crowd certainly like it. Nice Balls - More evidence of that fabulous first round from Brett Hailstone (Waiheke). This is the super-tough 4th. The wind is blowing hard and Brett has obviously decided "I'm going for this". We slow the video down for you so you can see how the force of his putt was what counts - the wind tries to whip the disc out, but those chains keep it in. Wild!. Nice Drive! - Speaking of Hailstones playing well, check out this birdie from little brother Nigel Hailstone (Auckland). There was even talk of the ace, but Nigel was more than happy to clock a 2 on the 15th. Jim's Rim - That's the name they gave the wild 150m par 4 12th. 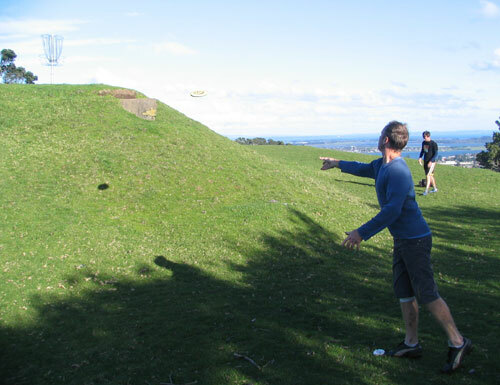 Not only did the players have to contend with the strong winds, they had to traverse some scary slopes and, to top it off, some visitor from down the line convinced Gabb to park the basket on the corner edge of the plateau. Here Brett Hailstone (Waiheke) tries his best to at least get close for par. Beast In Survival Mode - By the time we caught John 'The Beast' Helmink (Auckland) here on the 11th, he was in survival mode. He may be a local, but this particular course tested the tall left handed athlete to the limit. We want to ask him if he'll be back for the 2007 Crater, but we'll wait a wee while for the memories to fade. Standing Start - Watching Baz Keene (Auckland) on the 8th was something else. Standing at the tee - no movement of the feet whatsoever - and we saw his disc float perfectly to the tough pin position for a great birdie. Altitude With Attitude - Whilst the Traitor Crater course did not actually circumnavigate the park, it certainly did climb to afford some great views of New Zealand's biggest city. And here we see John 'The Beast' Helmink (Auckland) being tested by the even tougher pin placement of the Sunday rounds on hole 3. Pressure At The Top - Come Sunday and Brett Hailstone (Waiheke) was tournament leader thanks to a great 54 on the windy Saturday. The pressure to keep it up was immense, especially when surrounded by such talent as Simon, Dean and Blair. Here we see Brett not happy with himself for missing this one on 11 watched by Simon, but man, how's that wind? Pressure At The Top, Part 2 - And when its going bad, the luck seems to turn against you. Brett again as he shakes his head is dismay as his good drive results in a roller all the way to the bottom into a rock formation being built by some bunkers. Where's Des? - There's Des - there on the second tee. Des Cooper (Taumarunui) just got better and better over the weekend as he adapted his game to the Crater. 74, 70, 68. Blair Was There - Our lawyers have told us to simply state that Blair Joines (Taumarunui) was in attendance. No more. Always In Trouble - That's our Jim. Jim Gabb (Auckland) has been roaming around referring to himself as 'Ace' for some time - due to a couple of fine aces in tournaments. In true stubbornness, after hearing about Marty's ace, Jim was quick to ask - is this a PDGA sanctioned event like the one where I got the real ace on? No Kneedless Effort - With only a white bandage to show any signs of the recent major surgery to his knee, Dylan Cooper (Wellington) works the small window of opportunity perfectly here on the 5th to ensure a safe par. Nice golf - good endurance. Looks So Easy, But... - Hole 14 proved a test for Dylan Cooper (Wellington). After a classic was-gonna-sit-down-but-rolled-to-the-bottom close birdie putt, he threw a nice recovery 3rd for this bogie putt. Look Familiar? - All the players of the 2006 Crater Cup will appreciate this one. Des Cooper (Taumarunui) takes his time in the wind on hole 12. With nothing but disaster all around, chains are the only option. Nice putt.